If you would like to try mixing your own e liquid, this kit has everything you need. It is packed with handy mixing accessories, a step by step guide and contains the highest quality food and pharmaceutical grade ingredients. 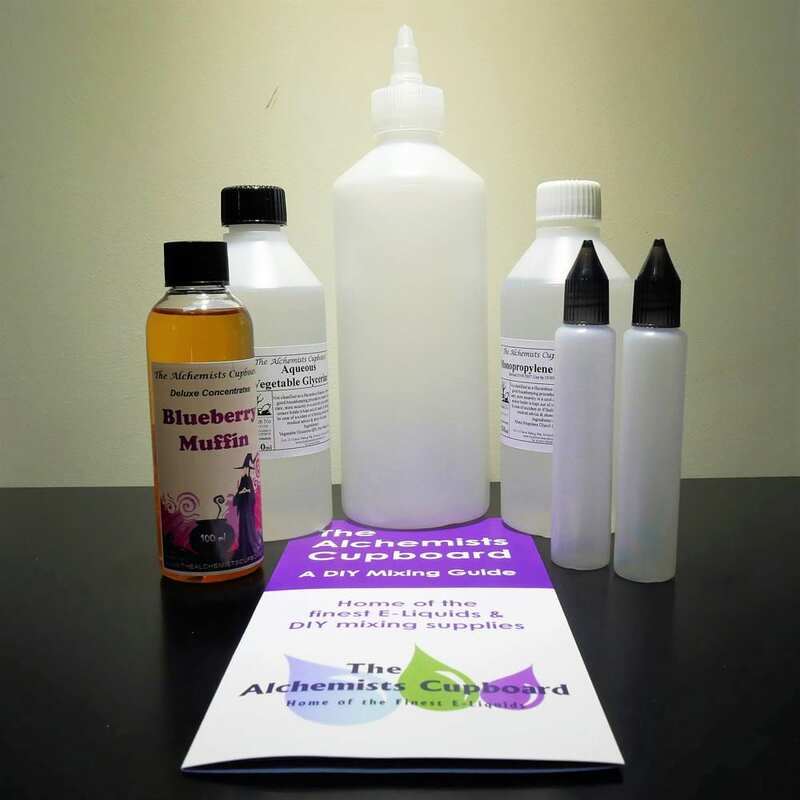 This kit from the base and flavouring supplied will make between 600ml of E-liquid dependant on percentage of flavour used in your mix. 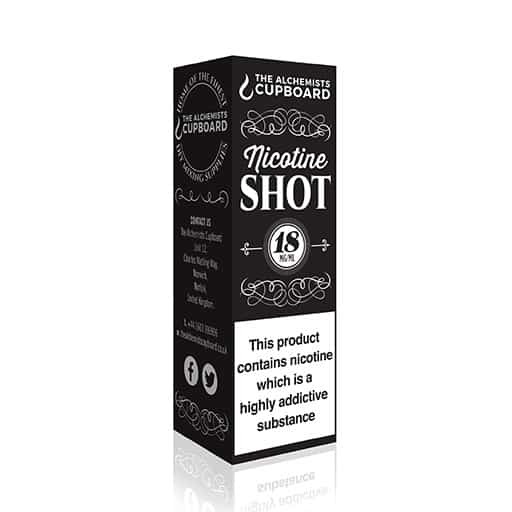 You will have considerable amounts of Nicotine left (dependant on your preferred strength) so the next time, you will make your juice much cheaper, due to not having to buy this again. If you need help working out the percentages to mix at, We highly recommend the (eJuice Me Up) mixing Calculator. *this is a fixed bundle and changes and amendments cannot be made. Excellent kit, has everything needed and I was amazed at how much liquid came with the pack! Was again amazed at how much liquid it made, so much liquid. I selected the Capella flavourings after hearing great things, couldn’t believe how gorgeous and real the flavourings smelt. The peaches & cream smell oozed from the bag when the post man delivered, was expecting a broken bottle but no… it was seriously just that strong! Another bonus was I ordered on a Friday lunch time and received it first thing Saturday. Now shopping for more flavours. Thanks alchemists. After my first review,i felt i needed to do a second. As before this kit is brilliant,good products,easy to use.i did find as one other review stated that after time the print will come off the syringes,this also happened to me only after lots of use with the same one.i would like to point out that it is print on plastic and will come off or fade with time.this really does not bother me as they are so cheap to replace.I love the kit,and making my own juice,its good fun.Thanks to all at the alchemist. 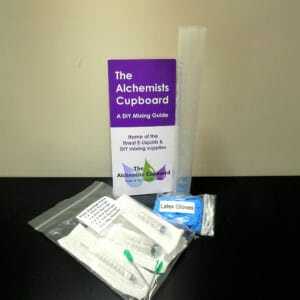 great kit not made anything yet but would just like to comment on the service that alchemists cupboard provide .. the package was posted promptly and received the next day well packaged.. After reading the reviews on this kit and the problem with the print coming of the syringe i have covered the print with sellotape to avoid this problem myself..
Purchasing from the Alchemists Cupboard was easy, Ordered Gold mixing starter kit on Wednesday afternoon, postie delivered Thursday am. 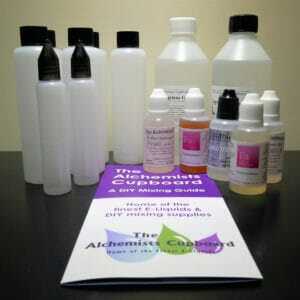 I have used previously for some pre mixed liquid, which were all great, as usual great customer service. Thanks again. Got my kit today and made my first ever 20ml bottle. Really happy with how easy it was and nice to get everything in one bag. Only slight criticism would be another 10ml and 1ml syringe would be handy to keep all the liquids separate without having to rinse them off, but that’s being picky. Very quick delivery too. Will be buying supplies from here next time for sure. 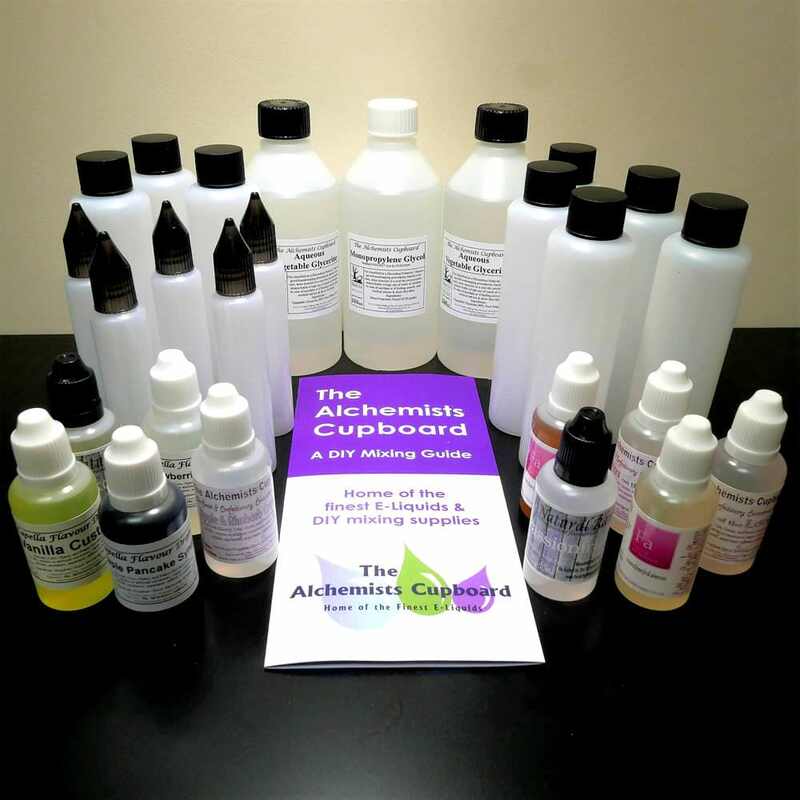 If you are experimenting with making ur own liquids then this is the kit for you. Not made any before but starting to become a pro now. Took me a couple of times to get it just right for me but the kit is a great help. Everything u need. Good price. Fast delivery. Fantastic starter kit for anyone looking to get into diy as it seems to be the best value for money compared to other sites. as already mentioned before in reviews i also advise you to use clear nail varnish on the syringes as the writing has a habit of rubbing off. excellent service and delivery. 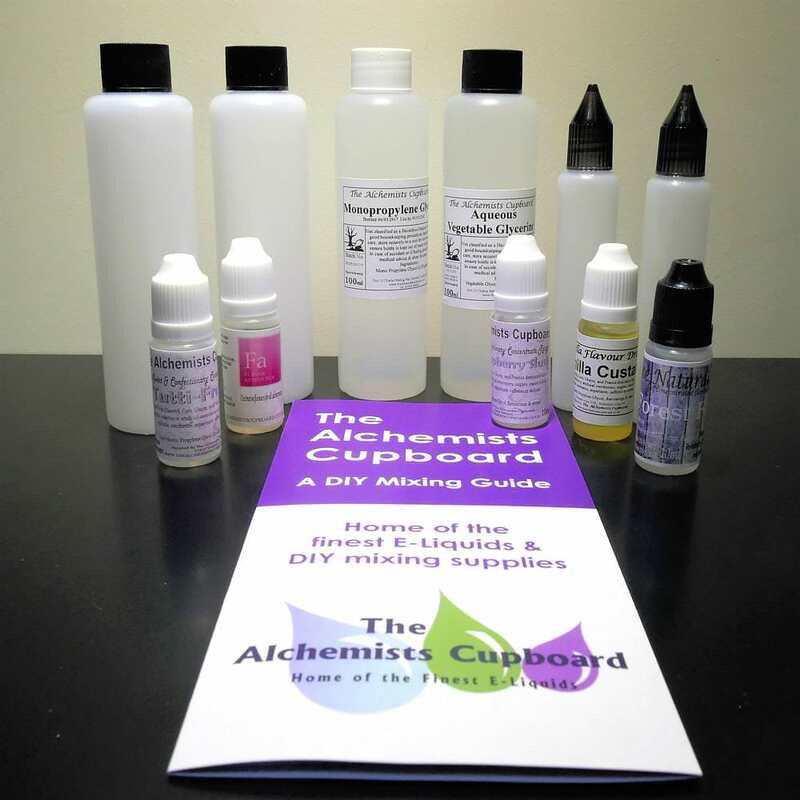 love the alchemist liquids,but since he started to sell a kit,its always been on my mind to have a go,Well what can i say,it was great fun,its like being back at school playing chemistry. The only thing i wish the kit had is a stirring tool.apart from that,its been good fun with great results.10/10. Ordered the gold kit and received very quickly. Only reason I haven’t given 5 out of 5 was because I received a silver kit. However a quick call and the matter was rectified. Making my own juice with ease and don’t know why I didn’t purchase sooner. Top Seller and Service provided. Many Thanks. Ordered this yesterday, turned up this morning! in less than 24hours I gone from total novice to chain vaping my very own liquid. Good sir, your company is spot on. Vaping was getting expensive, ? ?5 for one 10ml bottle, a friend recommended the alchemist to me for this kit and I was blown away by how much liquid I made. I wish I had done this sooner. Easy to use, great quality flavours, some of which I can recognise having bought premium liquids for a couple of years. Not as sweet, but a quick call and a good chat with a chap called Barry and I was advised to add a little sweetener, this came the next day and I’ve been vaping better juice than I was spending silly money on ever since. Great kit that will save you money and give you a new hobby! Fantastic kit for both starting out or a novice mixer. Bought this kit originally around 6 months ago and recently got another due to all the bits you get with the kit being very handy and cheaper to buy this way. Originally drawn to this kit for the ol?? tidy amount of concentrate and mixing apparatus that come with! 5 star product with 5 star service! Such a great little kit to get you on your way. Back for more concentrates but after spending ? ?60 in June, this is the first time I’ve had to buy any liquid since. Fantastic selection of flavours – and everything you need to more than get you on your mixing way. Was amazed how good my first attempts came out and then again how long they lasted. very fun to do and no hassles at all when you’re saving all that money. Highly recommend. Great value, great selection of flavours. 1st class service, placed my order 11.30am Friday and received Saturday morning. was amazed at how true the flavours smelt, if they taste the same (which I’m sure they will) I’ll be one happy Vaper. Very good value. Very good quality and boy does it make some liquid, doubt I’ll be buying any for a good few months. Great selection to choose from. You can smell them from the outta package they’re that good. Ordered Thursday, came Friday and I’m sat vaping my first lot of home made liquid tonight… And to be honest, it’s bloomin lovely. Never done it before and the kit was very easy to use, I had done some research prior to getting the kit though. Great selection of flavours, almost spoilt for choice, already know what flavours I’m getting next. The kit contained everything I needed and more. Great service, quality products and cheap. Great product, received my order in excellent condition, very well packed and protected. Was suprised at how big the kit was, haven’t even used half the stuff and I have enough liquid to last me weeks. From what I’ve vaped so far the liquid is great, brilliant flavour and very high quality. All in all a great kit at amazing value.